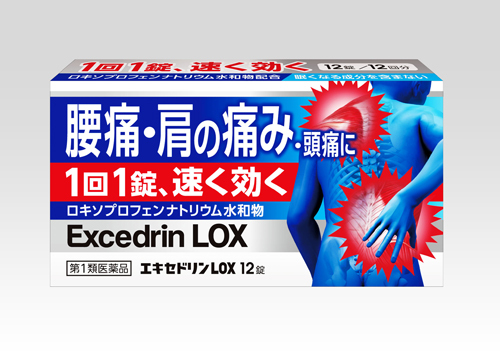 Lion Corporation (President: Itsuo Hama) announces the release of Excedrin LOX, an orally administered painkiller formulated with the antipyretic analgesic ingredient loxoprofen sodium hydrate for the highly effective relief of back, shoulder and other body pain. Excedrin LOX will be available February 4, 2015 at pharmacies and drug stores nationwide. A Lion consumer survey found that 85% of respondents experience frequent back, shoulder or other body pain. Specifically, 67.2% reported back pain; 66.9% reported shoulder or neck pain; and 61.9% reported muscle pain. Moreover, Lion found that respondents who complained of back, shoulder or neck pain outnumbered those who suffered from headaches. A notably large segment of body pain sufferers are 40 or older. Reflecting the aging of Japan’s population, the number of people ages 50 to 79 is expected to increase from 47 million as of 2014 to 49 million by 2025 (sources: 2014 estimates by Japan’s Ministry of Internal Affairs and Communications and 2012 estimates by the National Institute of Population and Social Security Research). In addition, a greater number of middle-aged and older individuals are expected to be active in the workforce going forward due in part to government policy that will raise the mandatory retirement age from 60 to 65. Although many of those who suffer from body pain use topical analgesic and anti-inflammatory medicines such as poultices and ointments, the majority of survey respondents were found to be dissatisfied with these products, particularly when using them away from home. Specifically, 69.4% complained about the products’ distinctive, noticeable odors, while 68.5% were concerned about the appearance of products, which can sometimes be seen through clothing. At the same time, those who expressed interest in orally administered painkillers prioritize products’ pain relief effectiveness (62%) and speed (37%) as well as inflammation reduction (30%). Now, in response to demand from consumers who do not want body pain to keep them from enjoying fulfilling working and private lives, Lion is releasing Excedrin LOX, a new product that provides quick pain relief with a single tablet. This ingredient acts on the source of pain (peripheral nerves), thereby delivering highly effective pain relief, especially against back pain and pain due to stiff shoulders. Although some antipyretic analgesic ingredients tend to irritate the gastric mucosa, loxoprofen sodium hydrate is a prodrug, meaning that it retains a form that causes minimal irritation during the course of digestion and absorption. Since it is converted to an active antipyretic analgesic ingredient only after absorption, this ingredient is easy on the stomach. Adults (15 years and older): take one tablet up to twice per day upon the development of symptoms. A third dosage is permissible if symptoms recur. Avoid taking on an empty stomach and wait at least four hours before taking again. Take with cold or warm water. Receive instructions from a pharmacist and carefully read the attached warnings before use. Ask a healthcare professional before use if you have drug or other allergies.